Young Living is always coming out with new ideas and products. This month I want to share with you the 10% off discounted kits and their new Vitality Essential Oils line which will give you even more ideas on how to use these fabulous little healthy bottles. The Vitality line is all about adding flavor to your favorite nutritious foods or using them as dietary supplements (oily vitamins I like to call them!). There is four distinct categories—Herb, Spice, Supplement and Citrus which I will share with you below. All citrus oils are fabulous to flavor your water with or in your homemade smoothies. Try a drop or two! Orange – so yummy added to baked goods. A chocolate orange brownie? Or how about your Oatmeal Raisin Cookies? Lime – add to any Mexican style meal. Flavor your tortilla soup or your fajita chicken. Best of all add a drop in your guacamole. I loooove guac! Lemon – try it in your hummus. Combine with garlic to chicken and cook in a crockpot all day. Citrus Fresh combines Orange, Grapefruit, Mandarin, Tangerine, and Lemon oils with a shot of spearmint. Doesn’t it just sound good? A few reminders…I’m always happy to help. Facebook Friend me – an account made specially for oil interest and allows me to include you in our fun oil groups to learn the oils, ask questions and win prizes. And I’ll always send you a Essential Oil Pocket Reference to read and learn + a Seasonal Oil (Orange Vitality right now!) of my choice once you sign up under my link. WIN Young Living’s Vitality Essential Oils! i play Rashguard Sun Shirt & green sprouts Snack Bag Giveaway ~ 2 Winners! These are great oils to get started with, I use them in the diffuser as they are stimulating when the day gets long. 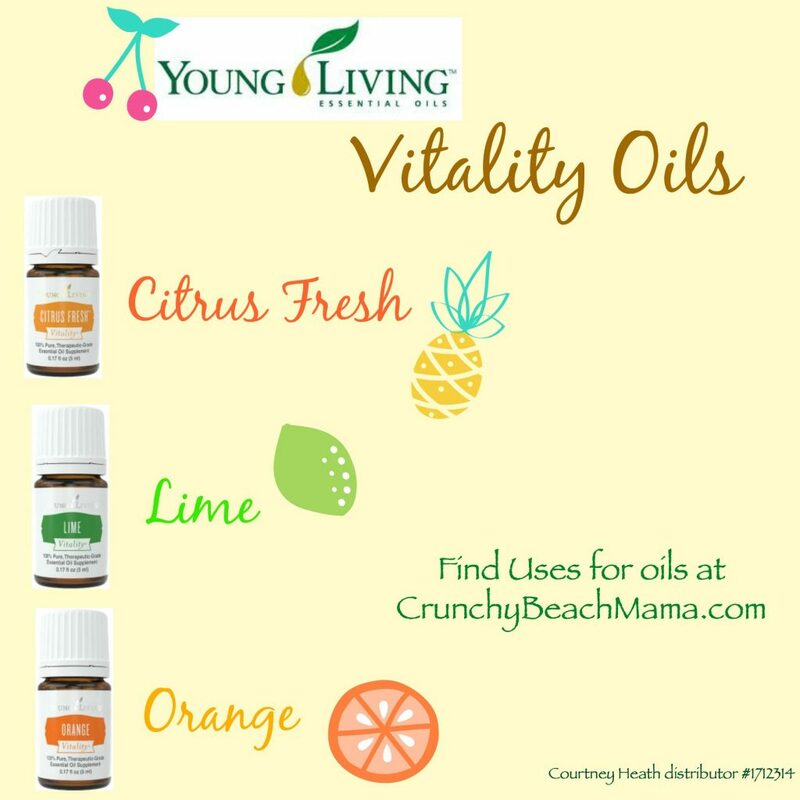 These Vitality Essential Oils really intrigue me! I'd love to try them out, then maybe I'd go for the 10% off Kit Box :) Thanks for this chance!! I don't think I wanna sell them, but I would definitely buy them. I do not know enough people to sell to. I have used some essential oils and have several that I really like, but there are others that I want to try as well. Thank you. I have been interested in trying essential oils for awhile- thankyou for the opportunity. I would love to, but hubby has been in the hospital for over a month and cannot afford at this time as he is the breadwinner. Lovely, though! I wish I could afford it. Being permanently injured makes it impossible to afford. Thank you for the giveaway! Yes, I am very interested in the Thieves oil. I love Essential Oils! I use them regularly. I've always wanted to try EOs. I've heard great things but they are pricey I wish there were a way to try it first! I love the citrus essential oils, thesmells put me in the best mood! I did try some lemon oil in my homemade hummus..it was delicious. I use essential oils, lavender everyday and peppermint and lemon a lot, I have never used the lime. I'd love to try these out. I like to put lemon on my air purifier. I would like to try these essential oils as a flavor to add to sparkling water from our Soda Stream. About another half a year and I'll be ready! ;-) I'm so looking forward to it! I am so wanting a full bottle of the thieves...right now though it's out of the question if we want to eat fresh fruits and veggies! LOL UGH they are so expensive right now! Lavender on my pillow to sleep is all I have ever used. I really want to get into essential oils and improve my food and health. A great way to try different oils! I recently got a couple of bottles of essential oils. I am finding they are wonderful. I just got my first oils recently. Loving them and looking for more ways to use them! I love experimenting with different oils!! I've been hearing a lot about essential oils and would love to try them! I'm very interested in essential oils-thanks for the giveaway! I really want to try new essential oils and want to learn how to use them. I love essential oils and have pretty many at the moment. I'd love to try the vitality line though. Thank you for the opportunity. I love essential oils. I use them in recipes and for cleaning. I don't know much about essential oils but would like to try them. Love essential oils. Use them daily. I already use essential oils. I would like to try some essential oils. I have been trying to win some for months. Essential oils are quite the treat. So many uses for them. I just started using essential oils and love them! I only have lavender oil so I am very interested in others! Sounds yummy! I haven't tried Young Living before (I've tried others though) and I have friends that rave about it. I haven't used essential oils before. They sound wonderful. Essential oils can be so helpful. I love them! I've just started using essential oils in cleaning and skin/body care! These essential oils sound wonderful, so light and fresh a perfect way to look forward to spring! I have just started using essential oils and are loving the many uses. I haven't used the oils I have very much but I do like the scents you shared above. I'm not ready to start yet but would love to try these essential oils. I am a newbie and excited to learn more about essential oils. I have had good success with essential oils before. I like Young Living's peppermint oil! I can't wait to try out the Orange and Lime essential oils. I have had a bottle of lemon before, which I loved using! I would love to try the Young Living Essenital Oils! Thanks for the chance! I want to start using essential oils! My wife likes essential oils. i would love to try these oils! I think essential oils are interesting. I am ready to try Young Living Essential Oils and these 3 would be a great start. Thanks for the giveaway. It's always nice to be able to try something before you buy it. I have some oils now but should use them more often. Lots of benefits! If I had the money I would totally make use of the 10 percent off! At the moment we don't have much though so it'll have to wait! I would love to start with the citrus oils, I have read they make excellent cleaning products and must smell heavenly difused. Thanks for the chance to win! My daughter loves her essential oils. I am thinking about trying them out also. I love essential oils. I always have them in my medicine cabinet. I honestly don't know what I'd do without them. I have never tried Young Living's brand though. Sounds good though. Tried some young living samples! I for sure am ready! I've been using essential oils for about 10 years now. Can always use more. Thanks for the contest.